Getting the statistic about the beer that you brewed is important for the serious homebrewing, but it may be forgotten by some destruction sometimes. I bottled my hoppy wheat ale and hoppy wit today. I forgot to measure the final gravity, but it was too late as I already put the priming sugar into the beer in the bottling bucket. However, I needed to find the gravity of the beer after fermentation to find out the ABV. Here is the answer I came up with by going back to the high school chemistry experiment. The difference of the boiling point between different types of fluid. 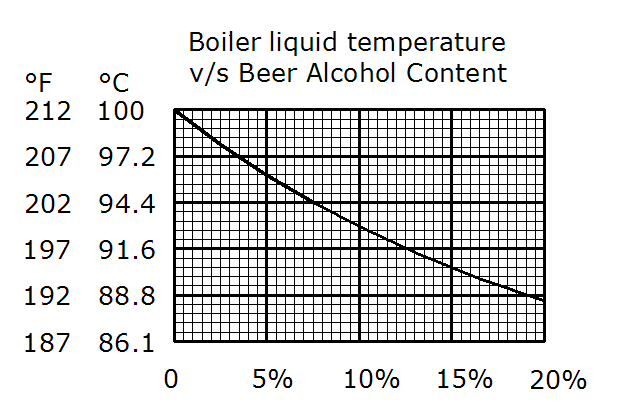 Boiling point of Ethanol is 78℃, hence the Ethanol contained beverage, Beer has lower boiling point than the pure water. 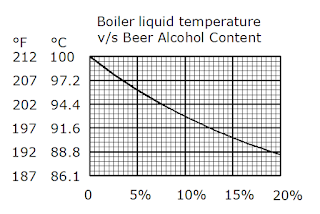 Here is the graph I referred to find out the ratio of the ethanol in the beer after it boiled at 95℃. This is really helpful, but not as accurate as using the gravity before and after fermentation. Yeah there's been a couple of times I've forgotten the OG, but never the FG. I was too excited about siphoning the beer into the keg... if I may give an excuse.